Summer is a time of picture-perfect days to enjoy picnics, baseball games and other outdoor activities. On the flip side, it can also mean enduring some sweltering, humid, too-hot-to-move days. We discovered several clever and easy ways to keep your cool on hot summer days. Here's a rundown of some of our favorites. Place linens in a plastic bag and put them in the freezer two or three hours before bedtime, then make your bed with them just before turning in. The refreshing coolness lasts long enough to allow you to fall asleep comfortably. Hot food in the summer is a double whammy. Turning on a stove or oven increases the ambient temperature, while eating hot foods raises your internal thermostat. Dine on the summer's rich bounty of produce along with cool foods such as cheese, yogurt, deli meats and creamy egg or potato salads. 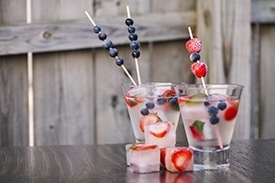 Fill an ice cube tray with fresh berries, add water and freeze. The colorful ice cubes keep your water cold while infusing it with a pleasing fruit flavor. Add variety by experimenting with oranges, lemons and pineapples. Freeze batches of berries to make handfuls of refreshing, crunchy treats. When it's too warm for coffee, ice it down with cubes made from coffee so your drink doesn't get watered down. Supercharge bottled and canned beverages by wrapping them with a wet paper towel and placing them in the freezer for about 15 minutes. Don't leave them in any longer or you could end up with a sticky mess. Steamy days are a good time to take advantage of air-conditioned movie theaters or places like libraries and coffee shops where you can linger indefinitely. You know how chilled you can get after a long cardio session or a vigorous game of tennis? That sensation is due to the process of evaporation. Cool your skin the same way by periodically spritzing with a mist of cool water. You can also achieve the effect by letting your body air dry in front of a fan after a bath or shower. With amenities like central air, ceiling fans and resort-style pools, our Springs luxury apartment homes are cool inside and out. Stop by and see why our Springs communities are a perfect home for all seasons.